We’re on a roll with the breakfast ideas this week, but these Apple Snickerdoodle Muffins may confuse you. Are they a breakfast? A dessert? A snack? Mostly what they are, though, is really frigging good. I had them for breakfast, snack, and dessert…and then I sneaked bits of them throughout the day in between. They’ve got that crumbly top. And that glaze. And nice, juicy apples. Oh my goodness me. I’ve made these twice since I got Jamielyn Nye’s “The I Heart Naptime Cookbook: More Than 100 Easy & Delicious Recipes to Make in Less Than One Hour.” I’ve been following her blog — I Heart Naptime — for years now, and it’s always full of fun ideas for things to make and bake and do. And the book is as well — recipes for easy meals that can be done in under an hour. Simple DIYs and crafts to finish in the same amount of time. Lots of creative ideas for those of us who get an hour here and there (like during naptime, see?). 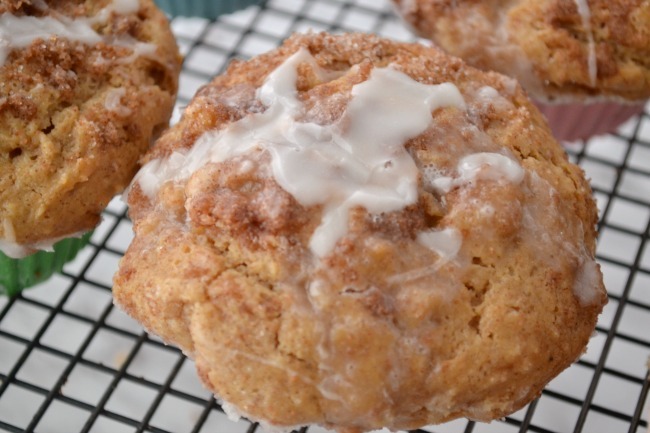 But this recipe for Apple Snickerdoodle Muffins? Well, I haven’t tried everything in the book yet, but it might be my favorite. Make the batter: In a medium bowl, stir together ¼ cup of the brown sugar, and 1 teaspoon of the cinnamon. Stir in the apple cubes and set aside. In a large bowl, using a hand mixer, beat together the oil, granulated sugar, and the remaining ¾ cup brown sugar until combined. Add the eggs, sour cream, and vanilla and mix until smooth. In a separate bowl, whisk together the flour, baking powder, nutmeg, the remaining 1 teaspoon cinnamon, and the salt. Slowly add the dry ingredients to the wet ingredients and mix until well combined. Fold in the cinnamon apples. Cover and refrigerate for 15 minutes. Preheat the oven to 425°F. Line two muffin tins with paper liners or spray with nonstick cooking spray. Make the topping: In a small bowl, using a fork, stir together the topping ingredients until the mixture is crumbly. Don’t overmix. Set aside. Using a large ice cream scoop or spoon, fill the muffin cups almost to the top. Sprinkle about 1 teaspoon of the topping over each muffin. Bake for 5 minutes, then reduce the oven temperature to 375°F and bake for 11 to 13 minutes more. Insert a toothpick into the center of a muffin to make sure it comes out clean. Transfer to a wire rack to cool for 10 minutes. Make the glaze (optional): In a small bowl, whisk together the powdered sugar and milk. Drizzle on top. I made these once, just for us…and once for our All-Mom Fantasy Football Draft Party, because nothing says football like a nice big plate of snickerdoodle muffins. Everyone loved them. We also just tried the Slow-Cooker Sweet & Sour Meatballs last night for dinner, and they’re going in our meal rotation now. There’s a whole section in the book on slow-cook meals, which we always desperately need right around now when school and everything else starts back up. You can find “The I Heart Naptime Cookbook” here on Amazon, or check for it at your local bookstore. Happy cooking!